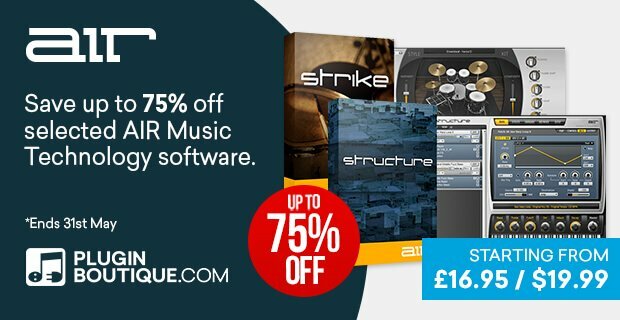 Plugin Boutique is offering up to 75% off selected AIR Music Technology plugins and bundles in a Spring Sale. Transfuser 2, a dynamic audio/MIDI environment for manipulating, slicing, and remixing your loops and sounds into something entirely new. Strike 2, a dynamic drum and arranger instrument that features a world-class sample library and a hyper-realistic performance engine. AIR Music Producer Pack + FREE Vault Expansion: Hybrid 3, The Riser + Free Flux Transitions Expansion Pack, and Creative FX Collection Plus. Velvet 2, a virtual electronic piano that combines five legendary electric pianos from the 60s and 70s into one versatile instrument. AIR Keyboard Collection, a bundle comprising Velvet 2, DB-33 and Mini Grand. Structure 2, a multi-timbral instrument with a built-in sample library and editor that enables you to combine, layer, and edit your samples. The offer expires June 3rd, 2019.